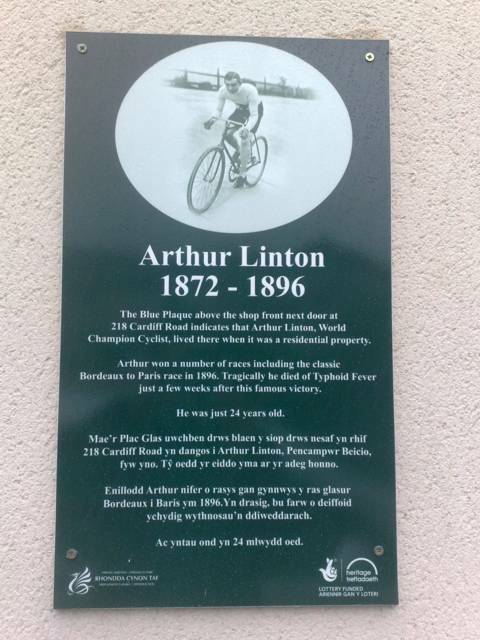 Arthur Linton became a world famous cycle racer in the 1890’s. He was born at the Volunteer in Seavington St Michael in 1868 where his father John was the innkeeper. They moved to Aberdare in South Wales in the early 1870’s. 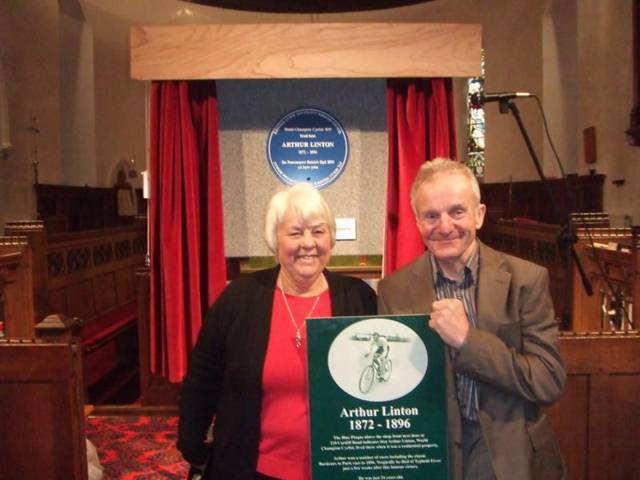 A Blue Plaque was recently put up on the family home in Aberdare to commemorate his achievements. During the 1880’s and 1890’s, following the invention of the chain driven safety bicycle, the sport of cycling became extremely popular with people from all walks of life. 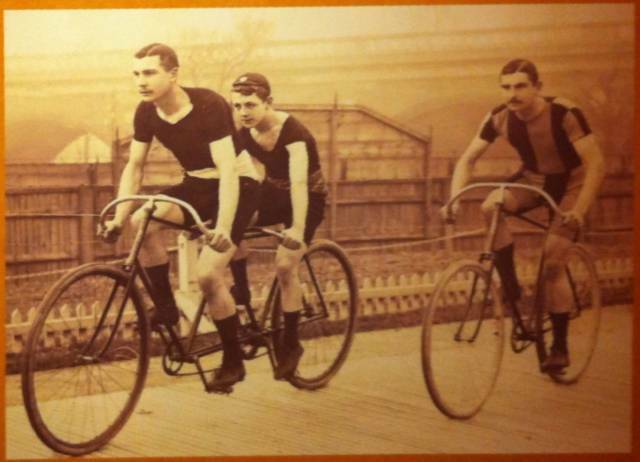 The sport was as popular in the Cynon Valley as elsewhere, in 1884 the Aberdare Bicycle Club was formed and by 1890 it had developed into a racing club. 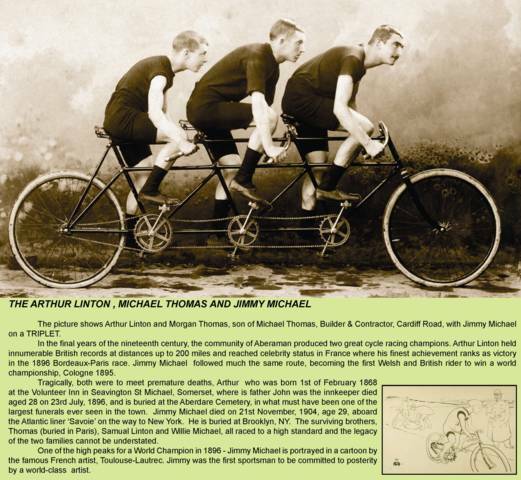 Extraordinarily, during this golden age of cycling Aberaman produced no less than four world class cyclists: the Linton Brothers Arthur, Tom and Samuel; and Jimmy Michael. Of these four Arthur Linton and Jimmy Michael became World Champions. 1895 was a less successful year for Arthur. He suffered a knee injury and split from his trainer ‘Choppy’ Warburton. However, it was during the 1896 season that Arthur won his greatest race, the Bordeaux to Paris Race in which he defeated Riviere. 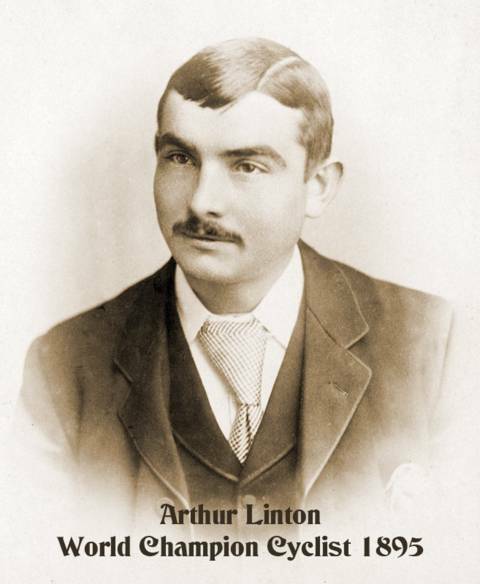 Tragically, it seems that this race took too much of a toll on his body and Arthur Linton died of Typhoid Fever in June 1896, only some six weeks after the race. He was just 24 years old when he died. A protégé of Arthur Linton, Jimmy Michael came to public attention in 1894 when he won the Herne Hill race in record time. He too was signed by ‘Gladiator’ and taken under the wing of ‘Choppy’ Warburton. In 1895 he continued his run of success, beating the French champion Lesna and later tied with Arthur Linton’s record for 50km. At the end of the year he became the World Middle Distance Champion at Cologne. As a result of Jimmy’s meteoric rise and the poor year suffered by Arthur Linton, an element of rivalry appeared between Jimmy and the Linton’s, especially Tom. 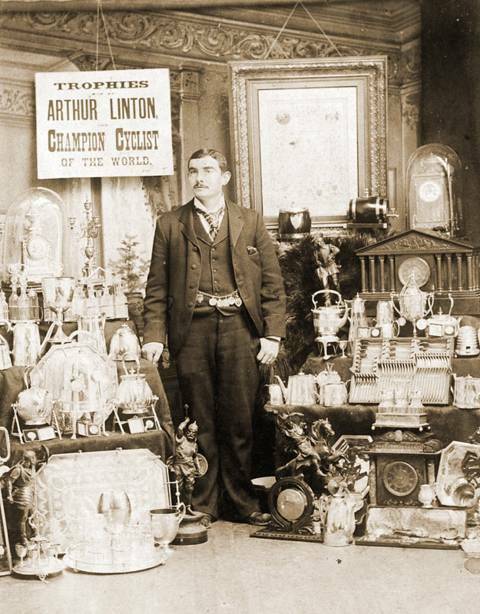 Shortly after Arthur’s death, Jimmy split from ‘Choppy’ Warburton and then decided to chance his arm in America, where he enjoyed a successful career, breaking many records and amassing a sizeable fortune. Jimmy retired from cycling for a while and instead became a jockey and racing stable owner, though when this venture failed Jimmy returned to cycling in 1902. Unfortunately, he was not the same rider on his return and did not recapture his earlier record breaking form. He died, aged only 29, in November 1904 on the liner ‘Savoie’ whilst travelling back to New York. The cause of death was an attack of delirium tremens, probably brought on through heavy drinking. Tom Linton continued to enjoy a successful racing career although he never enjoyed the same level of recognition as either Arthur or Jimmy. He died in 1914 of Typhoid Fever, the same disease that had killed his brother 18 years before. Samuel Linton had returned to work in the local collieries and died in 1935.